The Kelal Qatan (Concise Summary) was composed by David Ben Yom Tov, a Hebrew scholar who lived in the first half of the 14th century. He is known in Latin simply as David Iudaeus. This is a text on medical astrology, dealing primarily with the astrological indications pertaining especially to fevers. 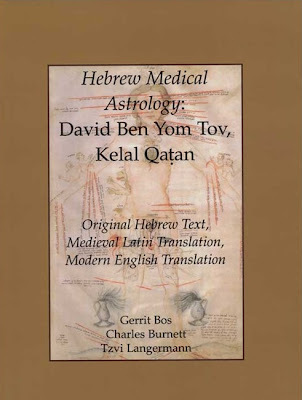 It is the most detailed & extensive original Hebrew treatise on astrological medicine surviving in Hebrew Literature. Contents of this edition: Introduction; Original Hebrew Text; The Latin Text; Modern English Translation; Glossary; & Bibliography. Color & black & white illustrations.